For other uses, see Horace Greeley (disambiguation). 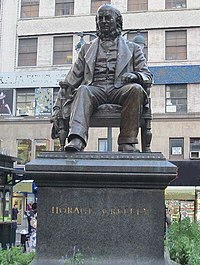 Horace Greeley (February 3, 1811 – November 29, 1872) was an American author and statesman who was the founder and editor of the New-York Tribune, among the great newspapers of its time. Long active in politics, he served briefly as a congressman from New York, and was the unsuccessful candidate of the new Liberal Republican party in the 1872 presidential election against incumbent President Ulysses S. Grant. Greeley was born to a poor family in Amherst, New Hampshire. He was apprenticed to a printer in Vermont and went to New York City in 1831 to seek his fortune. He wrote for or edited several publications and involved himself in Whig Party politics, taking a significant part in William Henry Harrison's successful 1840 presidential campaign. The following year, he founded the Tribune, which became the highest-circulating newspaper in the country through weekly editions sent by mail. Among many other issues, he urged the settlement of the American West, which he saw as a land of opportunity for the young and the unemployed. He popularized the slogan "Go West, young man, and grow up with the country. "[a] He endlessly promoted utopian reforms such as socialism, vegetarianism, agrarianism, feminism, and temperance, while hiring the best talent he could find. Greeley was the new Liberal Republican Party's presidential nominee in 1872. He lost in a landslide despite having the additional support of the Democratic Party. He was devastated by the death of his wife, who died five days before the election, and died himself three weeks later, before the Electoral College had met. 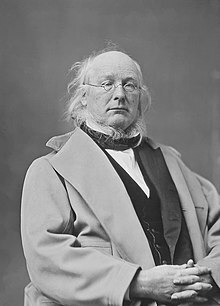 Horace Greeley was born on February 3, 1811, on a farm about five miles from Amherst, New Hampshire. He could not breathe for the first twenty minutes of his life. It is suggested that this deprivation may have caused him to develop Asperger's syndrome—some of his biographers, such as Mitchell Snay, maintain that this condition would account for his eccentric behaviors in later life. He was of English descent, and his forebears included early settlers of Massachusetts and New Hampshire. Greeley was the son of poor farmers Zaccheus and Mary (Woodburn) Greeley. Zaccheus was not successful, and moved his family several times, as far west as Pennsylvania. Horace attended the local schools, and was a brilliant student. In late 1831, Greeley went to New York City to seek his fortune. There were many young printers in New York who had likewise come to the metropolis, and he could only find short-term work. In 1832, Greeley worked as an employee of the publication Spirit of the Times. He built his resources and set up a print shop in that year. In 1833, he tried his hand with Horatio D. Sheppard at editing a daily newspaper, the New York Morning Post, which was not a success. Despite this failure and its attendant financial loss, Greeley published the thrice-weekly Constitutionalist, which mostly printed lottery results. On March 22, 1834, he published the first issue of The New-Yorker in partnership with Jonas Winchester. It was less expensive than other literary magazines of the time and published both contemporary ditties and political commentary. Circulation reached 9,000, then a sizable number, yet it was ill-managed and eventually fell victim to the economic Panic of 1837. He also published the campaign news sheet of the new Whig Party in New York for the 1834 campaign, and came to believe in its positions, including free markets with government assistance in developing the nation. Soon after his move to New York City, Greeley met Mary Young Cheney. Both were living at a boarding house run on the diet principles of Sylvester Graham, eschewing meat, alcohol, coffee, tea, and spices, as well as abstaining from the use of tobacco. Greeley was subscribing to Graham's principles at the time, and to the end of his life rarely ate meat. Mary Cheney, a schoolteacher, moved to North Carolina to take a teaching job in 1835. They were married in Warrenton, North Carolina on July 5, 1836, and an announcement duly appeared in The New-Yorker eleven days later. Greeley had stopped over in Washington, D.C. on his way south to observe Congress. He took no honeymoon with his new wife, returning to work while his wife took up a teaching job in New York City. In 1838, Greeley met Albany editor Thurlow Weed. Weed spoke for a liberal faction of the Whigs in his newspaper the Albany Evening Journal. He hired Greeley as editor of the state Whig newspaper for the upcoming campaign. The newspaper, the Jeffersonian, premiered in February 1838 and helped elect the Whig candidate for governor, William H. Seward. In 1839, Greeley worked for several journals, and took a month-long break to go as far west as Detroit. Greeley was deeply involved in the campaign of the Whig candidate for president in 1840, William Henry Harrison. He published the major Whig periodical the Log Cabin, and also wrote many of the pro-Harrison songs that marked the campaign. These songs were sung at mass meetings, many organized and led by Greeley. According to biographer Robert C. Williams, "Greeley's lyrics swept the country and roused Whig voters to action." Funds raised by Weed helped distribute the Log Cabin widely. Harrison and his running mate John Tyler were easily elected. By the end of the 1840 campaign, the Log Cabin's circulation had risen to 80,000 and Greeley decided to establish a daily newspaper, the New-York Tribune. At the time, New York had many newspapers, dominated by James Gordon Bennett's New York Herald, which with a circulation of about 55,000 had more readers than its combined competition. As technology advanced, it became cheaper and easier to publish a newspaper, and the daily press came to dominate the weekly, which had once been the more common format for news periodicals. Greeley borrowed money from friends to get started, and published the first issue of the Tribune on April 10, 1841 — the day of a memorial parade in New York for President Harrison, who had died after a month in office and been replaced by Vice President Tyler. Greeley, who had met his wife at a Graham boarding house, became enthusiastic about other social movements that did not last, and promoted them in his paper. He subscribed to the views of Charles Fourier, a French social thinker, then recently deceased, who proposed the establishment of settlements called "phalanxes" with a given number of people from various walks of life, who would function as a corporation and among whose members profits would be shared. Greeley, in addition to promoting Fourierism in the Tribune, was associated with two such settlements, both of which eventually failed, though the town that eventually developed on the site of the one in Pennsylvania was after his death renamed Greeley. In November 1848, Congressman David S. Jackson, a Democrat, of New York's 6th district was unseated for election fraud. Jackson's term was to expire in March 1849, but during the 19th century Congress convened annually in December, making it important to fill the seat. Under the laws then in force, the Whig committee from the Sixth District chose Greeley to run in the special election for the remainder of the term, though they did not select him as their candidate for the seat in the following Congress. The Sixth District, or Sixth Ward as it was commonly called, was mostly Irish-American, and Greeley proclaimed his support for Irish efforts towards independence from Great Britain. He easily won the November election, and took his seat when Congress convened in December 1848. Greeley's selection was procured by the influence of his ally, Thurlow Weed. The Tribune remained a Whig paper, but Greeley took an independent course. In 1848, he had been slow to endorse the Whig presidential nominee, General Zachary Taylor, a Louisianan and hero of the Mexican–American War. Greeley opposed both the war and the expansion of slavery into the new territories seized from Mexico, and feared Taylor would support expansion as president. Greeley considered endorsing former President Martin Van Buren, candidate of the Free Soil Party, but finally endorsed Taylor, who was elected; the editor was rewarded for his loyalty with the congressional term. Greeley vacillated on support for the Compromise of 1850, which gave victories to both sides of the slavery issue, before finally opposing it. In the 1852 presidential campaign, he supported the Whig candidate, General Winfield Scott, but savaged the Whig platform for its support of the Compromise. "We defy it, execrate it, spit upon it." Such party divisions contributed to Scott's defeat by former New Hampshire senator Franklin Pierce. In 1853, with the party increasingly divided over the slavery issue, Greeley printed an editorial disclaiming the paper's identity as Whig and declaring it to be nonpartisan. He was confident that the paper would not suffer financially, trusting in reader loyalty. Some in the party were not sorry to see him go: the Republic, a Whig organ, mocked Greeley and his beliefs: "If a party is to be built up and maintained on Fourierism, Mesmerism, Maine Liquor laws, Spiritual Rappings, Kossuthism, Socialism, Abolitionism, and forty other isms, we have no disposition to mix with any such companions." 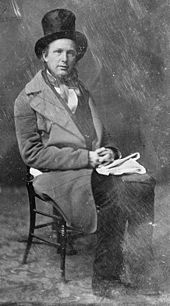 When in 1854, Illinois Senator Stephen Douglas introduced his Kansas–Nebraska Bill, allowing residents of each territory to decide whether it would be slave or free, Greeley strongly fought the legislation in his newspaper. After it passed, and the Border War broke out in Kansas Territory, Greeley was part of efforts to send free-state settlers there, and to arm them. In return, proponents of slavery recognized Greeley and the Tribune as adversaries, stopping shipments of the paper to the South and harassing local agents. Nevertheless, by 1858, the Tribune reached 300,000 subscribers through the weekly edition, and it would continue as the foremost American newspaper through the years of the Civil War. The Kansas–Nebraska Act helped destroy the Whig Party, but a new party with opposition to the spread of slavery at its heart had been under discussion for some years. Beginning in 1853, Greeley participated in the discussions that led to the founding of the Republican Party and may have coined its name. Greeley attended the first New York state Republican Convention in 1854, and was disappointed not to be nominated either for governor or lieutenant governor. The switch in parties coincided with the end of two of his longtime political alliances: in December 1854, Greeley wrote that the political partnership between Weed, William Seward (who was by then senator after serving as governor) and himself was ended "by the withdrawal of the junior partner". Greeley was angered over patronage disputes, and felt Seward was courting the rival The New York Times for support. In 1853, Greeley purchased a farm in rural Chappaqua, New York, where he experimented with farming techniques. In 1856, he designed and built Rehoboth, one of the first concrete structures in the United States. The Tribune continued to print a wide variety of material. 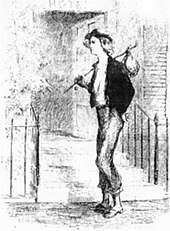 In 1851, its managing editor Charles Dana recruited Karl Marx as a foreign correspondent in London. Marx collaborated with Friedrich Engels on his work for the Tribune, which continued for over a decade, covering 500 articles. Greeley felt compelled to print, "Mr. Marx has very decided opinions of his own, with some of which we are far from agreeing, but those who do not read his letters are neglecting one of the most instructive sources of information on the great questions of current European politics." Greeley sponsored a host of reforms, including pacifism and feminism and especially the ideal of the hard-working free laborer. Greeley demanded reforms to make all citizens free and equal. He envisioned virtuous citizens who would eradicate corruption. He talked endlessly about progress, improvement, and freedom, while calling for harmony between labor and capital. Greeley's editorials promoted social democratic reforms, and were widely reprinted. They influenced the free-labor ideology of the Whigs and the radical wing of the Republican Party, especially in promoting the free-labor ideology. Before 1848 he sponsored an American version of Fourierist socialist reform. but backed away after the failed revolutions of 1848 in Europe. To promote multiple reforms Greeley hired a roster of writers who later became famous in their own right, including Margaret Fuller, Charles Anderson Dana, George William Curtis, William Henry Fry, Bayard Taylor, Julius Chambers and Henry Jarvis Raymond, who later co-founded The New York Times. For many years George Ripley was the staff literary critic. Jane Swisshelm was one of the first women hired by a major newspaper. In 1859, Greeley traveled across the continent to see the West for himself, to write about it for the Tribune, and to publicize the need for a transcontinental railroad. He also planned to give speeches to promote the Republican Party. In May 1859, he went to Chicago, and then to Lawrence in Kansas Territory, and was unimpressed by the local people. Nevertheless, after speaking before the 1st ever Kansas Republican Party Convention at Osawatomie, Kansas, Greeley took one of the first stagecoaches to Denver, seeing the town then in course of formation as a mining camp of the Pike's Peak Gold Rush. Sending dispatches back to the Tribune, Greeley took the Overland Trail, reaching Salt Lake City, where he conducted a two-hour interview with the Mormon leader, Brigham Young, the first newspaper interview Young had given. Greeley encountered Native Americans, and was sympathetic, but like many of his time, deemed Indian culture inferior. In California, he toured widely and gave many addresses. If the Cotton States shall become satisfied that they can do better out of the Union than in it, we insist on letting them go in peace. The right to secede may be a revolutionary one, but it exists nevertheless ... And whenever a considerable section of our Union shall deliberately resolve to go out, we shall resist all coercive measures designed to keep it in. We hope never to live in a republic where of one section is pinned to the residue by bayonets. Similar editorials appeared through January 1861, after which Tribune editorials took a hard line on the South, opposing concessions. Williams concludes that "for a brief moment, Horace Greeley had believed that peaceful secession might be a form of freedom preferable to civil war". This brief flirtation with disunion would have consequences for Greeley—it was used against him by his opponents when he ran for president in 1872. In the days leading up to Lincoln's inauguration, the Tribune headed its editorial columns each day, in large capital letters: "No compromise!/No concession to traitors!/The Constitution as it is!" Greeley attended the inauguration, sitting close to Senator Douglas, as the Tribune hailed the beginning of Lincoln's presidency. When southern forces attacked Fort Sumter, the Tribune regretted the loss of the fort, but applauded the fact that war to subdue the rebels, who formed the Confederate States of America, would now take place. The paper criticized Lincoln for not being quick to use force. Initially supportive of Andrew Johnson's lenient Reconstruction policies, Greeley soon became disillusioned, as the president's plan allowed the quick formation of state governments without securing suffrage for the freedman. When Congress convened in December 1865, and gradually took control of Reconstruction, he was generally supportive, as Radical Republicans pushed hard for universal male suffrage and civil rights for freedmen. Greeley ran for Congress in 1866, but lost badly, and for Senate in the legislative election held in early 1867, losing to Roscoe Conkling. As president and Congress battled, Greeley remained firmly opposed to the president, and when Johnson was impeached in March 1868, Greeley and the Tribune strongly supported his removal, attacking Johnson as "an aching tooth in the national jaw, a screeching infant in a crowded lecture room," and declaring, "There can be no peace or comfort till he is out." Nevertheless, the president was acquitted by the Senate, much to Greeley's disappointment. Also in 1868, Greeley sought the Republican nomination for governor, but was frustrated by the Conkling forces. Greeley supported the successful Republican presidential nominee, General Ulysses S. Grant in the 1868 election. In 1868, Whitelaw Reid joined the Tribune 's staff as managing editor. In Reid, Greeley found a reliable second-in-command. Also on the Tribune's staff in the late 1860s was Mark Twain; Henry George sometimes contributed pieces, as did Bret Harte. In 1870, John Hay joined the staff as an editorial writer. Greeley soon pronounced Hay the most brilliant at that craft ever to write for the Tribune. Greeley maintained his interest in associationism. Beginning in 1869, he was heavily involved in an attempt to found a utopia, called the Union Colony of Colorado, on the prairie in a scheme led by Nathan Meeker. The new town of Greeley, Colorado Territory was named after him. He served as treasurer and lent Meeker money to keep the colony afloat. In 1871, Greeley published a book What I Know About Farming, based on his childhood experience and that from his country home in Chappaqua. The Democrats, when they met in Baltimore in July, faced a stark choice—either nominate Greeley, long a thorn in their side, or split the anti-Grant vote and go to certain defeat. They chose the former, and even adopted the Liberal Republican platform, calling for equal rights for African Americans. This was the first time one man had been nominated for president by two political parties. Greeley resigned as editor of the Tribune for the campaign, and, unusually for the time, embarked on a speaking tour to bring his message to the people. As it was more usual for candidates for major office to not actively campaign, he was attacked as a seeker after office. Nevertheless, in late July, Greeley (and others, such as former Ohio governor Rutherford B. Hayes) thought he would very likely be elected. Greeley campaigned on a platform of intersectional reconciliation, arguing that the war was over and the issue of slavery was resolved. It was time to restore normality and end the continuing military occupation of the South. The Republican counterattack was well-financed, accusing Greeley of support for everything from treason to the Ku Klux Klan. The anti-Greeley campaign was famously and effectively summed up in the cartoons of Thomas Nast, whom Grant later credited with a major role in his re-election. Nast's cartoons showed Greeley giving bail money for Jefferson Davis, throwing mud on Grant, and shaking hands with John Wilkes Booth across Lincoln's grave. The Crédit Mobilier scandal—corruption in the financing of the Union Pacific Railroad—broke in September, but Greeley was unable to take advantage of the Grant administration's ties to the scandal as he had stock in the railroad himself, and some alleged it had been given to him in exchange for favorable coverage. Greeley's wife Mary had returned ill from a trip to Europe in late June. Her condition worsened in October, and he effectively broke off campaigning after October 12 to be with her. She died on October 30, plunging him into despair a week before the election. Poor results for the Democrats in those states that had elections for other offices in September and October presaged defeat for Greeley, and so it proved. He received 2,834,125 votes to 3,597,132 for Grant, who secured 286 electors to 66 chosen for Greeley. The editor-turned-candidate won only six states (out of 37): Georgia, Kentucky, Maryland, Missouri, Tennessee and Texas. Greeley resumed the editorship of the Tribune, but quickly learned there was a movement under way to unseat him. He found himself unable to sleep, and after a final visit to the Tribune on November 13 (a week after the election) remained under medical care. At the recommendation of a family physician, Greeley was sent to Choate House, the asylum of Dr. George Choate at Pleasantville, New York. There, he continued to worsen, and died on November 29, with his two surviving daughters and Whitelaw Reid at his side. His death came before the Electoral College balloted. His 66 electoral votes were divided among four others, principally Indiana governor-elect Thomas A. Hendricks and Greeley's vice presidential running mate, Benjamin Gratz Brown. Although Greeley had requested a simple funeral, his daughters ignored his wishes and arranged a grand affair at the Church of the Divine Paternity, later the Fourth Universalist Society in the City of New York, where Greeley was a member. He is buried in Brooklyn's Green-Wood Cemetery. Among the mourners were old friends, Tribune employees including Reid and Hay, his journalistic rivals, and a broad array of politicians, led by President Grant. Greeley was an eclectic and unsystematic thinker, a one-man switch-board for the international cause of "Reform." He committed himself, all at once, to utopian and artisan socialism, to land, sexual, and dietary reform, and, of course, to anti-slavery. Indeed Greeley's great significance in the culture and politics of Civil War-era America stemmed from his attempt to accommodate intellectually the contradictions inherent in the many diverse reform movements of the time. The Tribune remained under that name until 1924, when it merged with the New York Herald to become the New York Herald-Tribune, which was published until 1966. The name survived until 2013, when the International Herald-Tribune became the International New York Times. ^ a b Lunde, p. 11. ^ a b Tuchinsky, pp. 4–5. ^ a b c d Williams, p. 58. ^ Snay, pp. 11, 23. ^ a b Williams, p. 59. ^ a b Snay, p. 63. ^ a b Tuchinsky, p. 145. ^ Walter J. Gruber and Dorothy W. Gruber (March 1977). "National Register of Historic Places Registration:Rehoboth". New York State Office of Parks, Recreation and Historic Preservation. Archived from the original on 2011-12-04. Retrieved 2010-12-24. ^ Adam-Max Tuchinsky, "'Her Cause Against Herself': Margaret Fuller, Emersonian Democracy, and the Nineteenth-Century Public Intellectual." American Nineteenth Century History 5.1 (2004): 66-99. ^ Kathleen Endres, "Jane Grey Swisshelm: 19th century journalist and feminist." Journalism History 2.4 (1975): 128. ^ a b Williams, p. 203. ^ Van Deusen, p. 230. ^ Van Deusen, pp. 231, 241–245. ^ Van Deusen, pp. 248–253. ^ Van Deusen, pp. 256–257. ^ a b Williams, p. 219. ^ Van Deusen, pp. 279–281. ^ Van Deusen, pp. 282–285. ^ a b Williams, p. 233. ^ a b Goodwin, p. 471. ^ Van Deusen, p. 301. ^ Van Deusen, pp. 306–309. ^ Van Deusen, pp. 303–304. ^ Van Deusen, pp. 310–311. ^ Van Deusen, pp. 354–355. ^ Van Deusen, pp. 342–349. ^ Cohen, Adam (1998) [TIME, December 21, 1998, Vol.152, No.25]. "An impeachment long ago: Andrew Johnson's saga". cnn.com. Retrieved May 11, 2018. ^ Van Deusen, pp. 368–373. ^ Van Deusen, p. 377. ^ Van Deusen, p. 320. ^ Hale, pp. 300, 311. ^ a b Seitz, p. 404. ^ Iver Bernstein (1991). The New York City Draft Riots: Their Significance for American Society and Politics in the Age of the Civil War. Oxford UP. p. 184. ^ a b Van Deusen, p. 428. ^ "Hear Herald-Tribune Folds in New York". Chicago Tribune. August 13, 1966. pp. 2–10. ^ Schmemann, Serge (October 14, 2013). "Turning the Page". International Herald Tribune. ^ "Horace Greeley". NYC Parks. Retrieved December 11, 2014. ^ Linn, William Alexander (1912). Horace Greeley: Founder and Editor of the New York Tribune. D. Appleton. pp. 258–259. OCLC 732763. ^ Van Deusen, p. 430. Lunde, Erik S. (1981). Horace Greeley. Twayne's United States Authors Series. Twayne Publishers. ISBN 0-8057-7343-6. Nevins, Allan (1931). "Horace Greeley". Dictionary of American Biography. 7. Scribner's. pp. 528–34. OCLC 4171403. Snay, Mitchell (2011). Horace Greeley and the Politics of Reform in Nineteenth-Century America. Rowman & Littlefield Publishers Inc.
Tuchinsky, Adam (2009). Horace Greeley's New-York Tribune: Civil War–Era Socialism and the Crisis of Free Labor. Cornell University Press. ISBN 978-0-8014-4667-2. JSTOR 10.7591/j.ctt7zfzw. Lunde, Erik S. "The Ambiguity of the National Idea: the Presidential Campaign of 1872" Canadian Review of Studies in Nationalism 1978 5(1): 1–23. Mott, Frank Luther. American Journalism: A History, 1690-1960 (1962) passim. Parton, James. The Life of Horace Greeley (1889) online. Reid, Whitelaw. Horace Greeley (Scribner's sons, 1879) online. Robbins, Roy M., "Horace Greeley: Land Reform and Unemployment, 1837–1862," Agricultural History, VII, 18 (January, 1933).